Friday Freeday! - Stop staring and start sewing! We're trying to continue sprucing things up around here and since Joey has been working on a new storage system for the boys clothes (almost there!) 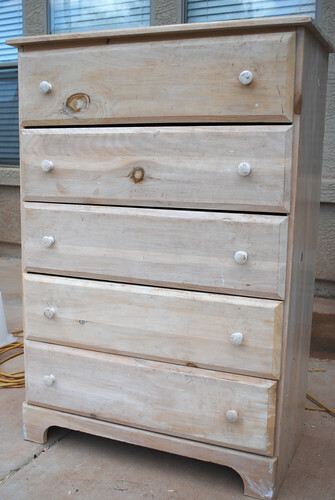 we were able to take their dresser and give it to Sofia. 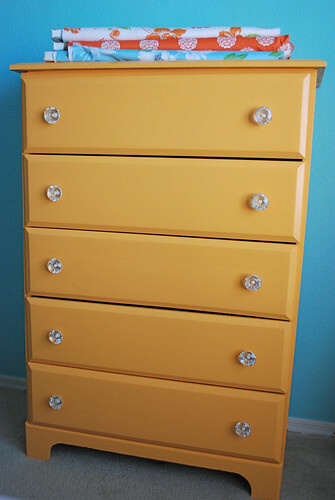 This dresser has been juggled between kids for 17 years and the inside still bears the sloppy paint ("whitewash", which was the fashion) job of my first toddler (now 18 year old). I let her splash some paint around on the inside to keep her happy while I got it ready for the new baby (now 16 year old). So it's belonged to each of my 5 kids at one time or another and now it's Sofia's turn again (her clothes are in a pile in her closet so this is going to be great!). I let Sofia paint it herself since she had done such a great job painting her room. 3 bright coats and only a few bugs became a permanent part of the finish (she painted it outside). The wall paint was my first choice for my kitchen but I didn't like it once I got it home. Well I loved the color but not for the kitchen, if that makes sense. Fortunately Sofia wanted a blue room so I didn't have to buy more paint. 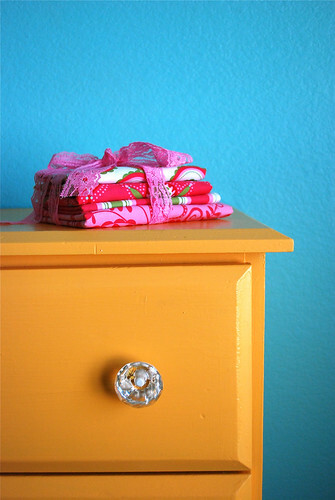 I got the new dresser knobs at Hobby Lobby (50% off!). The fabrics are going to go into her quilt and pillows. I think it will be a fun and pretty room, just right for a 13 year old. And here's a cute little give away! This pretty pink pile has nearly 1.5 yards of fabric total (all 45" across) and is the last of the pink Whimsy fabric by Michael Miller's Pillow and Maxfield (plus the lace). Just leave a comment and tell me what you're sewing this weekend. And speaking of Michael Miller fabric....all the 2009 prints are marked down to 5.50 a yard until they're gone (but they're going fast). This includes fabrics from Patty Young, Sandi Henderson, Paula Prass, and Pillow & Maxfield (sorry but it doesn't include the new Spring prints). Just click on the logo to take a look.